Stay in control of a hectic schedule with this write-on, wipe-off planner. Undated organizer features space for notes, comments and color coding. Mounted to a masonite back, then set in an elegant gold-trimmed, jet black plastic frame. Wall Panel Brackets sold separately. Stay in control of a hectic schedule with this write-on, wipe-off planner. 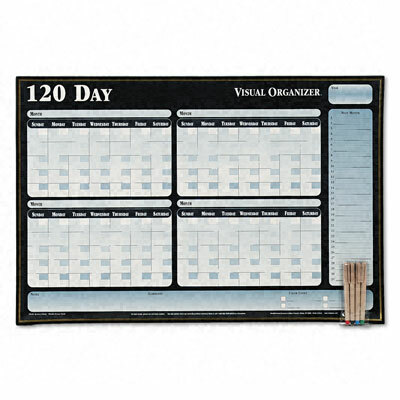 Undated organizer features space for notes, comments and color coding. Wipes clean with damp cloth. Mounted to a masonite back, then set in an elegant gold-trimmed, jet black plastic frame. Package includes four wet-erase markers (black, blue, green and red) and mounting hardware. Wall Panel Brackets sold separately. 21 1/2h x 32w.